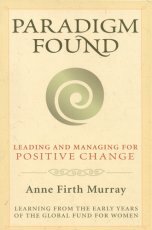 In 1987, Anne Firth Murray had the idea that funding should go to grassroots women's organizations around the globe and that the recipients themselves should decide how to use that money. From that idea, The Global Fund for Women was born. The organization became a major force for good in the world, embodying a new paradigm of philanthropy. In these pages, Murray shares her wisdom, offering guidelines that demonstrate how anyone can turn a clear vision of a better world into reality.